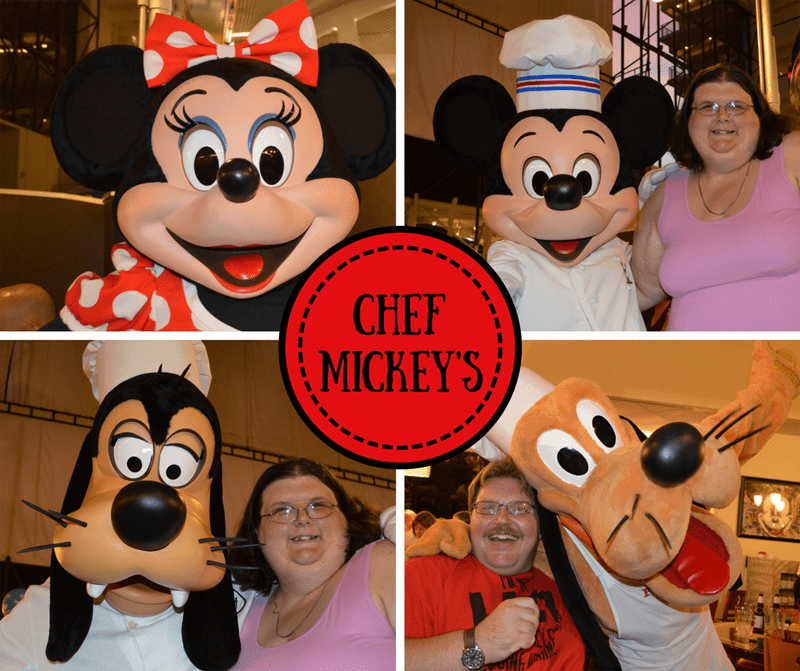 If you want to meet the classic Disney Characters like Mickey, Mouse, Goofy, and Donald without lots of lines in addition to a great meal then character dining at Chef Mickey’s is a Disney vacation must-do! 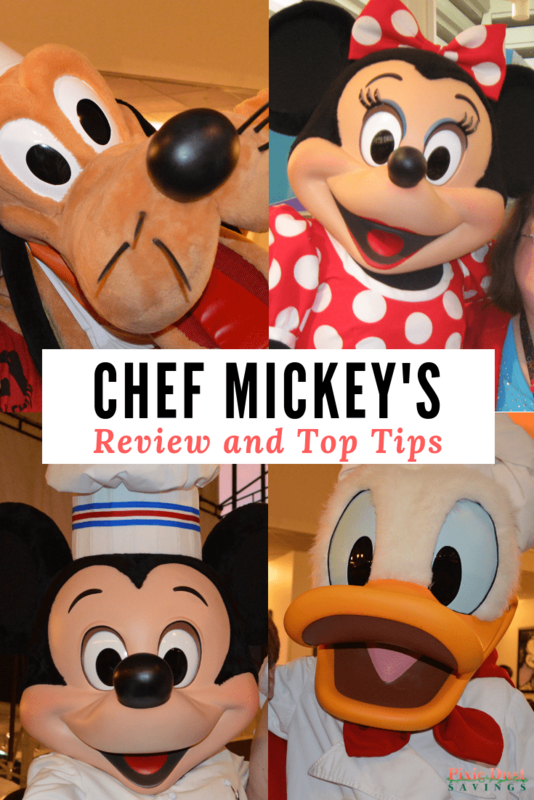 I have enjoyed Chef Mickey’s for breakfast, brunch, and dinner want to share with you my review and top tips for Chef Mickeys! Chef Mickey’s is located in the Contemporary Resort. Chef Mickey’s is a great first-day dining option because it does not require a park ticket to get into and you get all the atmosphere of Disney World. First, you get to meet Mickey Mouse and no trip is complete without him. Second, kids and adults are both wowed by the Monorail train that runs through the Contemporary Resort and can be seen from your table. Lastly, you get great Disney service and yummy food! If you are just going to the meal and have your car, you may park at the Contemporary Resort. If you do not have your car and are coming from another Walt Disney World resort you have a couple options. You can utilize the Minnie Van service which does have a price tag. You can also take a bus to the Magic Kingdom and then walk to the Contemporary or take the Monorail. Another option is to use Uber or Lyft, especially for those early morning reservations. 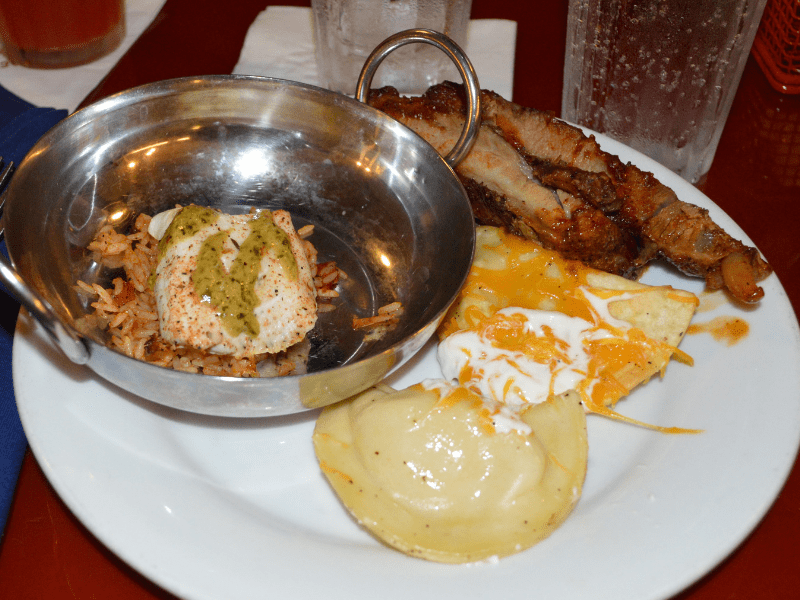 Chef Mickey’s is an all you care to eat buffet for breakfast, brunch, and dinner. I have been to every meal time and love the selections at all of the meals. 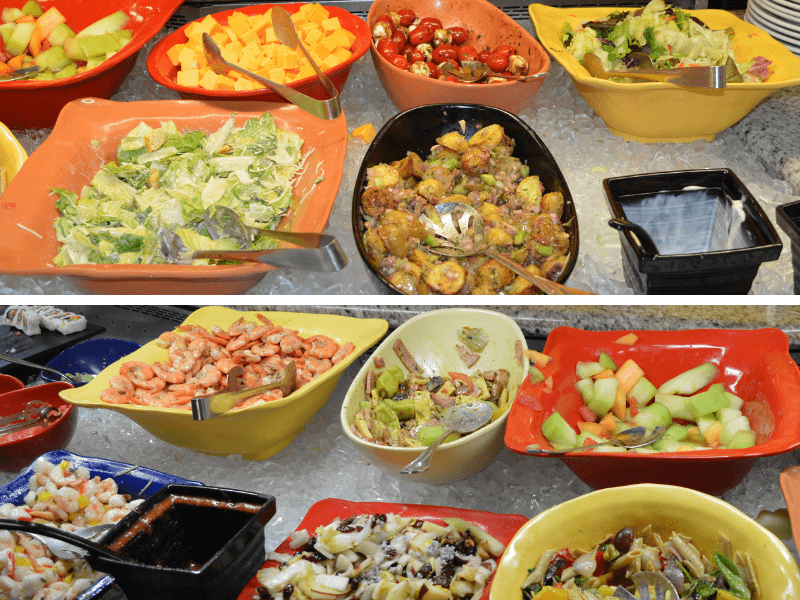 The salad bar is pretty much same for brunch and dinner. Selections include poached shrimp cocktail, smoked salmon with accompaniments, and seasonal salads. There is also yogurt and toppings like granola and fruit. The fruit assortment for all meals is great! My husband absolutely loved the tomato and mozzarella salad offered during the dinner. For breakfast and brunch, there are eggs, the famous Mickey Mouse waffles, a pancake bar, a southwest hashbrown casserole, bacon, sausage, and biscuits & gravy. You can also find different breakfast breads and a toaster. One of my favorites is having a bagel with the red pepper cream cheese. Yum! For brunch and dinner, there are chicken nuggets, macaroni & cheese, Tator tots, and other kid-friendly choices. Dinner selections include the Chef’s Carving Station featuring Prime Rib, seasonal vegetables, chili cornbread casserole, roasted chicken, glazed salmon, pot roast, seafood paella, and mashed potatoes. Overall, the food is great but not super amazing. With character dining, you are mostly paying for the experience, not necessarily the food. 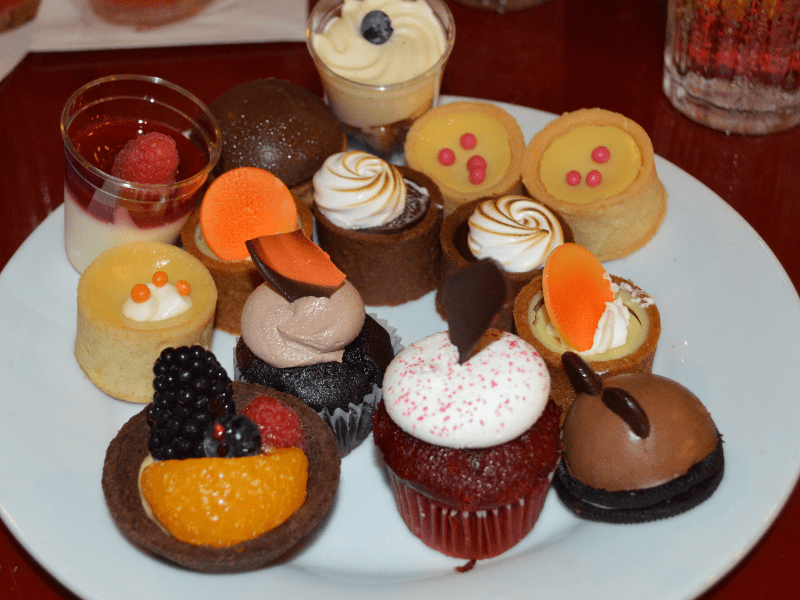 Desserts at Chef Mickeys are super cute and decadent. I did try quite a few, but my eyes were definitely bigger than my stomach. The Mickey Domes are the best! Overall the meal was good, but the character interactions were amazing and I will remember them for a lifetime! Characters at Chef Mickey’s include Mickey Mouse, Minnie Mouse, Pluto, Donald, and Goofy. They are dressed in chef’s attire. During the meal, you get visited by all of the characters. There is also a celebration where you take your napkin and swirl it around and have a mini dance party with Mickey and his friends. A special song comes on and everyone gets in on the fun! 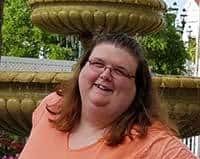 If you miss a character because of getting up to go to the buffet, just let your server know and the character can come back around. It is best to make a reservation. You can make advanced dining reservations up to six months in advance. Since Chef Mickey’s is popular I would make the reservation as soon as your dining window opens up. If you are using an authorized Disney Vacation planner (free to use) like A2M Travel, they can make the reservation for you so you do not have to wake up at 7 am eastern time. If you are not on the Disney Dining Plan, you do need a credit card on file when making a reservation, but it does not get charged unless you fail to cancel. When making a reservation, be sure to mention if you are celebrating a birthday or other special occasion. Birthday cards and/or a special birthday cupcake is common but never guaranteed. You never know what magic they can have in store for you. Have an autograph book ready. Characters do sign autographs during character meals. You can buy official autograph books ahead of time. If you are looking for more creative ideas, check out my 20+ Creative Character Autograph Ideas. Have some character interaction ideas ready. The characters are great to play with. At Chef Mickey’s the characters are dressed like chefs. My husband asked Goofy if he was allowed to use the knives. I complimented Minnie on her nut stuffing (a short from Mickey’s Once Upon a Christmas). Sometimes the characters will lead the interaction, but it is always good to have some ideas on hand. Remember to budget for tipping. Tipping is not included in the Disney Dining Plan. Our server was awesome and since we were recovering from the Florida heat, I was very impressed with how often refills were brought out. Budget enough time for the character interaction. It takes about an hour to an hour and a half to meet all the characters. They go around to each table one at a time. No need to feel rushed. Have Fun! The food is good, the character interactions are memorable, the view is amazing, and you also get to party while you dine! 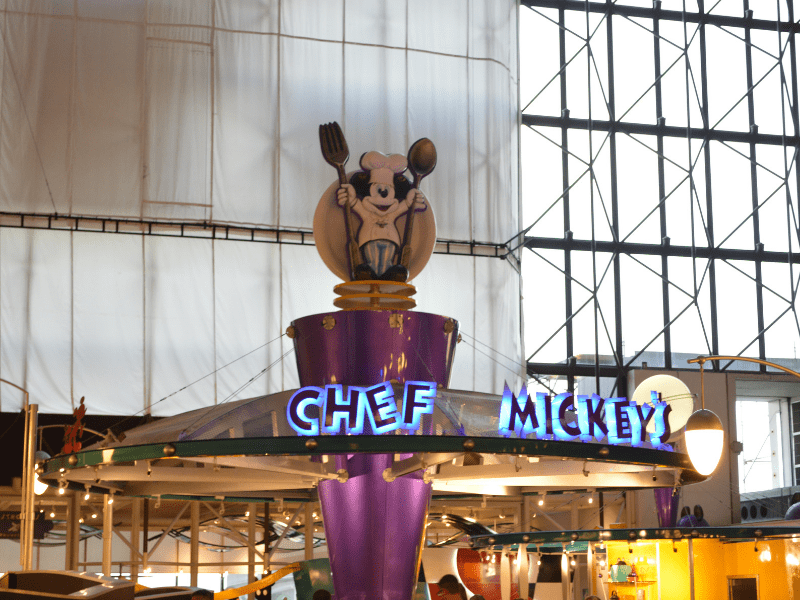 What has been your most memorable experience at Chef Mickey’s? This post was originally published August 26th, 2015. I really don’t like Chef Mickey’s for dinner. It tends to be loud in there and the offerings (other than ribs) are pitiful. Their breakfasts are good but we avoid it as kids are running and screaming and sticking their nasty hands in stuff. We usually stay in the Yacht Club, Beach Club, or Beach Club villas. For a lot of good food for one price, Ohana at the Polynesian is great.